Forklift Attachments for Lifting Drum, Bulk Bag, Pipe & Buying Tips - Be Certified Today! Forklift attachments for lifting are indispensable tools to have flexibilities to do many tasks. They’re used in conjunction with the forklift to perform more functions and expand its lifting capabilities. You can easily convert your forklift into a mobile and portable crane to do more and everyday jobs such as carrying pipes and drums, transporting coils and bulk bags and lifting cars. Lifting attachments provide the solution without adding hefty investment for running your business. It is a cost-saving alternative for an easy project that requires safe handling. When you choose to add an attachment to your machine, you will get more benefits from your equipment. It can act just like a crane. Lifting attachments come in different forms and sizes. They also differ in functionalities. To find the right one for your need, think about how you need to use your forklift. Lifting attachment such as drum carrier and gripper is a good substitute for manual handling if your application primarily involves the transporting of drums. Drum carriers can perform efficient handling operation – that lifts, tilts and pours materials. they make the handling of drums faster and safer. It eases the strenuous work involved in dispensing the contents of the drum. By relieving a lot of the manual work, you increase efficiency and boost safety. Some types of drum handlers that do lift, tilt and pour operation are capable of rotating the drum from 180 up to 360 degrees, relieving the operator from an inconvenient effort in placing the truck in right position to prevent dispensing spillage. Remote function to tilt and rotate the drum can also be available on some models. When buying, consider the load capacity of the product you will be buying. Usually, the drum carrier has a 2000-lb or 1000-lb load capacity. If your application doesn’t involve dispensing of the content, the drum gripper can do the work for you. The drum gripper does the basic tasks of picking up steel drums and moving them to other locations without leaving the cabin of the forklift. Ask yourself how many drums you will be moving? Drum gripper can be either be single or two-drum capacity. If your daily application or if the large portion of your business mostly engaged in handling a lot of drums, you may opt to buy the 2-capacity drum grabber. Otherwise, the single-capacity can also do the job. You can watch this video to know how it is done. The installation of drum gripper is so easy. It only takes a minute or two. Lay the drum gripper on the ground, position the forklift, slide the forks into the tubes, tighten the restraint by fastening the bulkhead screw, you are ready to do the job. Forklift attachment such as the bag lifter is suitable for manufacturing use or in an industrial setting. What’s good about your forklift is that you can use it for secure and safe transportation of bulk bags in and around the warehouse. You just need a bulk bag lifter and you can do the job done easily. The most significant advantage of using bulk bag lifter is of course safety. It allows the forklift operator to single-handedly attach the bulk bag to the lifter. During the manual process, many workers are injured when holding lifting loop. The bulk bag lifter eliminates that manual task. If bulk bag lifter is the one you need for your application, you can buy this on Amazon. With lifting hoist attachment, you can extend the normal capacity of the forklift to do the work just like a crane. The boom telescopes to a certain length and can be adjusted at an angle to give you better clearance when lifting to a certain height. It allows the truck to hoist the load in the air safely. The adjustable boom allows the operator to gain access to narrow shelves and stack loads on top of each other with ease. Ideal for lifting concrete slabs, stacks of plywood and many other irregularly-shaped materials that need to be placed further and higher. The extendable job is designed to easily slide and secure onto the tines. It has one hook or two for attachment of the chain that carries the load. It is able to extend to a certain length by adjusting it manually in telescope design. If you will be moving loads that are hard to palletize such as long pipes, bar stocks, logs, metal rods and other objects that may suitable for forklift jib. Lifting work that does not require palletizing such as moving of portable generators, dismounting engines, and transporting oddly-shaped items. When you found the ideal lifting attachment that suits your application, the next thing you would do is buying it. But without proper knowledge prior to purchasing, you could find yourself in trouble because you bought an attachment that is not compatible or doesn’t adhere to the technical requirements of your forklift. When you’re buying a lifting attachment consider the lifting capacity and mechanical limitation of your truck. 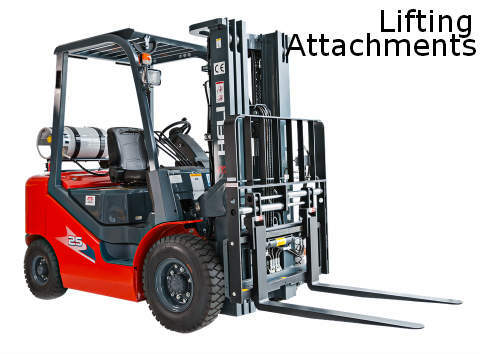 The weight of the attachment together with the load being handled can drastically diminish the lifting power of the forklift. Get a written approval from the forklift manufacturer. Modifying or adding attachments that have an effect on the capacity and on the safe operation of the forklift shall not be carried out unless there’s an approval from the truck’s manufacturer. Before buying, ask first the manufacturer about the attachment you want to install if it is compatible. In case, you cannot get an approval from the manufacturer, for whatever reason, it is acceptable to get an approval from a professional engineer instead. When you’ve acquired the lifting attachment, retrain your forklift operators about its use. They must be familiar with the capacity and limitation. You can check the operator’s manual for instruction. Remember, safety is always the top priority; therefore, retraining must be done. Choosing the respectable brand. You find products at a lower price being offered by the lesser-popular brand. Does the attachment have quality? You would rather spend money on a product that is top-quality even it if is more pricey. Consider all uses of the lifting attachment. Buying an attachment is a business investment and you should maximize its use now and in the future. You would not want to buy today a lifting attachment for your steel drum when in the future you would shift to using plastic ones. You would rather buy an attachment that handles both kinds of drums. To ensure that you’re buying the right lifting attachments that suit your requirements, following the above-mentioned tips can assist you in making the correct decision and avoiding the mistake. Forklifts are an effective solution for any material handling needs. However, we do know that forklift sometimes doesn’t perform the job we want to do. The truck can become even more flexible and multipurpose if you add lifting attachments. The lifting attachments boost the versatility of the machine to lift, push, rotate and clamp. They’re easy to install and use. They make the loading and transporting of heavy materials much easier and faster. Find the forklift attachments for lifting that suits your application. Your business will off to becoming efficient.